Planning a reception or dinner? 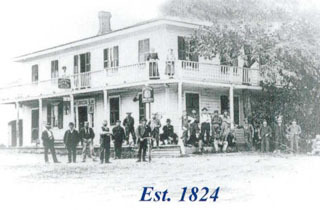 The most memorable gatherings are 200 years in the making at Tillman's Historic Village Inn! Let us develop a package to meet your budget. Call our Event Specialist, Victoria Mortenson today to discuss your needs. Ten Reasons To Have Your Event With Us! 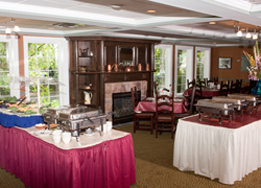 Open year round, seven days a week for lunch and dinner, the historic Village Inn is the choice for your event. 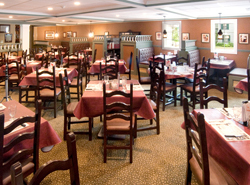 Our facilities featuring five dining rooms can be used to accommodate your party for banquets, weddings, showers, and other special occasions. The historic elegant atmosphere, authentic hand hewn beams, fireplace and large windows makes the Carriage Room an ideal place for large parties from weddings, rehearsal dinners and showers to business client seminars. Total accommodations in the most historic barn in WNY to 250. Call Mark for more information. During the winter months this roaring fire keeps you warm and cozy while you enjoy your meal. Otherwise, summer allows you to overlook the beautiful gardens outside the large bay windows. A definite relaxing atmosphere. The smallest private meeting room which accommodates small groups up to 40. Located near the tavern section of the facility, makes this the perfect meeting area for a small group in an entertaining atmosphere. 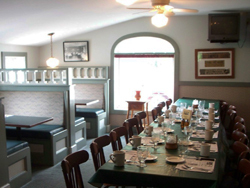 This room is the original dining room of the historic restaurant. 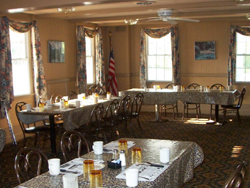 Accommodating up to 50 person(s) makes this the perfect room for small gatherings or intimate business seminars.